This entry was posted in news and tagged awards on November 13, 2015 by James Day. J.D. Power released its 2015 US Sales Satisfaction Index Study and MINI tops the Mass Market Brands category for the sixth consecutive year. 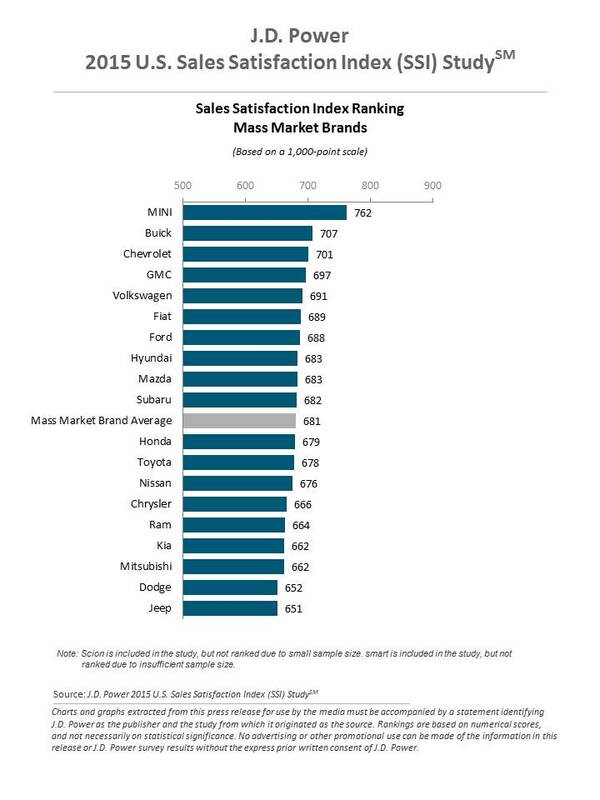 now in its 29th year, measures satisfaction with the sales experience among new-vehicle buyers and rejecters—those who shop a dealership and purchase elsewhere. Buyer satisfaction is based on four factors: working out the deal (17%); salesperson (13%); delivery process (11%); and facility (10%). Rejecter satisfaction is based on five factors: salesperson (21%); fairness of price (8%); experience negotiating (8%); facility (7%); and variety of inventory (7%). Satisfaction is calculated on a 1,000-point scale. Overall sales satisfaction improves to 688 in 2015 from 686 in 2014. For a sixth consecutive year, MINI ranks highest among mass market brands, with a score of 762, a 35-point increase from 2014.